an international network of Sahaja Yogis interacting with Indigenous Spirituality worldwide. 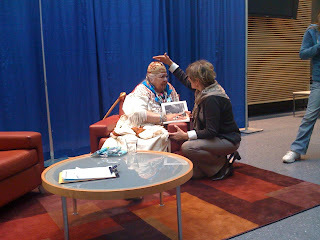 Another chance arose to meet with a Native American Indian. 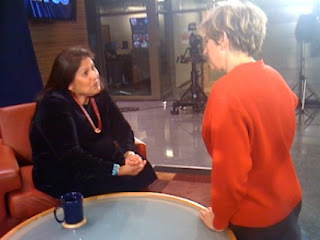 The public television station of Penn state University interviewed Sonya French-Begay of the Three Rivers American Indian Center. She was trying to raise awareness to the desecration of Indian land by Mining companies strip mining for Uranium. Their methods have caused tremendous environmental and health hardships to the land and the Native People. We just returned from a public meeting with one of the Native People's Grandmothers, Agnes Baker Pilgrim from the Takelma nation, who is touring the world with their message of peace and hope. She spoke about the Mother Earth and the need to respect her, and about water how we all come from it and that it is sacred and has a spirit. She stressed the importance of not only respecting our elders but also that we should grow into respectable elders. Afterwards I went to speak to her and asked her if she ever heard of self realization. She said no and I told her that my Mother taught me about this very energy she had been speaking to us about and that my Mother taught me to feel the earth's heartbeat and to recognize the spirit in the water, the air and the fire. I thanked her for going all over the world with her beautiful message and asked her if I could share with her this gift of self realization. She said yes, and upon touching her Sahasrara I told her that from now on we would be one and she embraced me.